Explore your transportation options for getting to Foxwoods Casino in southeastern Connecticut. 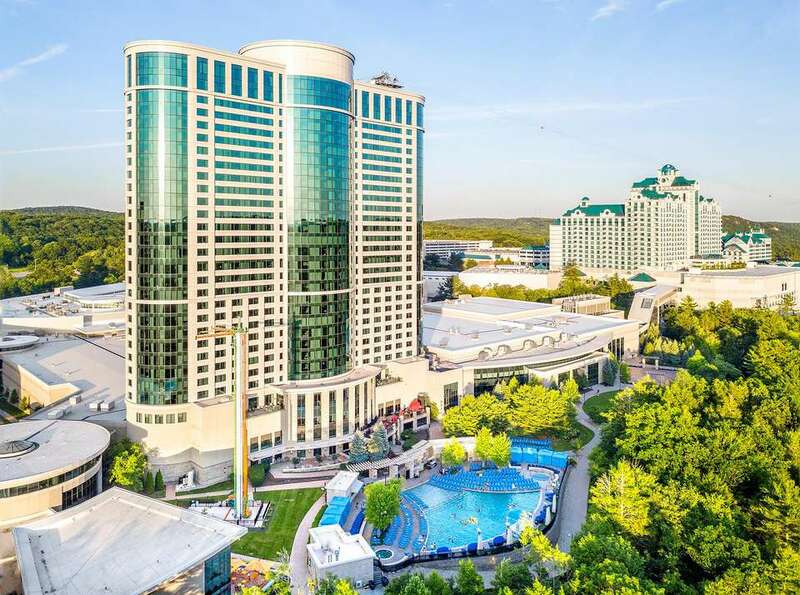 Foxwoods is located at 350 Trolley Line Boulevard in Mashantucket, Connecticut. Whether you're traveling from New York, Boston, Providence or Hartford, here are driving directions to Foxwoods Resort Casino in Mashantucket, Connecticut. The closest airport to Foxwoods is T.F. Green (PVD) in Warwick, RI. The second closest airport would be Hartford's Bradley International Airport (BDL). Warwick is just under an hour's drive from Foxwoods; Bradley is just over an hour's drive. If you wanted to avoid renting a car, you could try to connect to a Foxwoods bus. There's one bus company, MDT Bus Lines, that leaves daily from the Park and Ride in Warwick, Rhode Island, at Route 117 and I-95 on Centerville Road. Call 508-336-7111 or 508-557-1428 to confirm schedule information. Or one shuttle service that departs from Constitution Plaza in Hartford, Joshua's Limousine. Reserve by calling toll free, 866-217-5674. Both would require cab rides from the airport. All aboard! Amtrak will get you to Foxwoods by train to New London, then bus to the casino. Call toll free, 800 USA-RAIL, for more information and reservations. More than 100 buses pull into Foxwoods every day. Even if you own a car and don't mind driving, there are advantages to taking a bus to Foxwoods. Many motorcoach services provide perks to riders such as meal credits and slot play bonuses. If you're a frequent Foxwoods visitor, you may qualify for a VIP Bus Pass. Golf & Gamble: Hole in Won Worldwide offers fabulous combination outings featuring round-trip transportation via deluxe motorcoach, continental breakfast served en route to Richmond Country Club, a golf tournament and contest organized on the way there, 18 holes of golf with cart, a prime rib dinner after golf (chicken or fish also available), four hours plus at Foxwoods Casino, a $40 Foxwoods match play, and beer, wine, soda and munchies served on the way home. Other Connecticut and Rhode Island golf courses may also be selected. V.I.P. Casino Express - Maine: V.I.P. Tours offers Maine's only regularly scheduled bus runs to Foxwoods. Departure points are in Portland, Biddeford and Wells, Maine, and Seabrook, New Hampshire. Yankee Trails, New York: Yankee Trails departs from Albany-area points for occasional day trips to Foxwoods. For additional information on bus trips to Foxwoods, call toll free, 888-BUS-2FOX. Bridgeport to Port Jefferson Ferry Foxwoods Package: This ferry operated by the Bridgeport & Port Jefferson Steamboat Company, departs from Port Jefferson on New York's Long Island bound for Bridgeport, Connecticut, from where you'll be transported by motorcoach to Foxwoods. Cross Sound Ferry Services, Inc.: Cross Sound Ferry Services will take you from Long Island to New London, Connecticut, just a short distance from Foxwoods casino.